Enjoy many FREE services when you bring these coupons! Take home a FREE TV with your purchase at Bed Dazzzles. Receive this excellent savings when you mention or bring this ad from your local Victoria Connection Direct Mail & Online Magazine...just tap the green button below to download, print, bring anytime! Why choose Chesnick Furniture Co.? 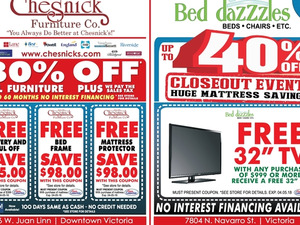 "Chesnick Furniture Co. is a family-owned discount Mattresses, Furniture and Appliances store based in Victoria, TX. Since 1920, Chesnick Furniture Co. has served customers in Victoria, Cuero, Edna, El Campo, Ganado, Goliad, Hallettsville, Port Lavaca, Refugio, Yoakum and Yorktown with low prices on Mattresses, Furniture and Appliances products and top notch customer service. Our knowledge on the Mattresses, Furniture and Appliances we sell sets us high above the competition. Chesnick Furniture Co. is an authorized dealer of such brands as Basset, Best, England, Lane, Tempurpedic, Simmons, Sealy, Spring Air, Coaster, and more. We can help you select your new Mattresses, Furniture and Appliances purchase at any budget. We look forward to seeing you at Chesnick Furniture Co., serving Victoria, Cuero, Edna, El Campo, Ganado, Goliad, Hallettsville, Port Lavaca, Refugio, Yoakum and Yorktown in Texas since 1920."